Using a mortar and pestle, grind both peppercorns finely. Add in garlic, coriander root, salt, palm sugar and pound into a paste. Stir in fish sauce, dark soy sauce water and water until mostly dissolved. Set aside. Using a pair of scissors, cut along the centre of the chicken, removing the spine bone. Reserve for gravy. Trim off excess fat and chicken tail. Using a knife, make a slit at the centre cartilage and press the chicken open. Place butterflied chicken, skin side up in a large bowl or tray. Carefully insert your fingers in between the breast skin and flesh and pour in 1 tbsp marinade. Rub to distribute the marinade evenly. Repeat with the rest of the legs. Pour remaining marinade all over the chicken and let it rest at room temperature for 30 mins. Put the spine bone in a small pot and pour just enough water to cover the bones. Allow it to boil and simmer for 15 mins. Turn off heat and set aside. Arrange the lemon grass, onions and galangal onto a roasting tray. Set the chicken, skin side up onto the herbs. Pour ½ cup water into the roasting tray. This will prevent the herbs from browning. 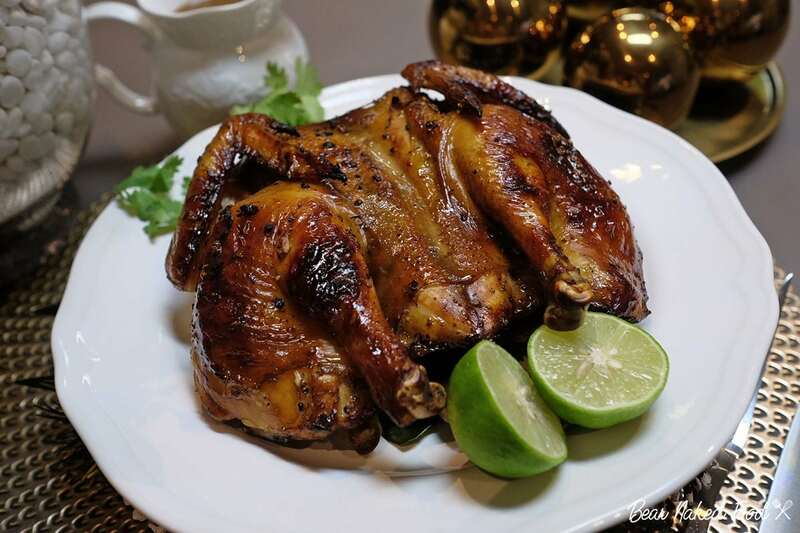 Roast chicken for 45 – 60 mins (depending on the size of your chicken). Loosely cover with aluminum foil and reduce temperature to 200°C/400°F if the skin is browning too quickly. Add a little more water to the roasting tray if the tray is dry. Insert thermometer into the thickest part of the chicken and if it reads 70°C/160°F, it is done. Pour the pan drippings into the chicken stock and bring to boil. Simmer and reduce the stock by half. Taste and adjust with more salt if necessary. Add in coconut milk, dark soy sauce and bring to boil. Stir in half of the cornstarch solution and thicken according to your preferred consistency. Squeeze in lime juice and turn off heat.